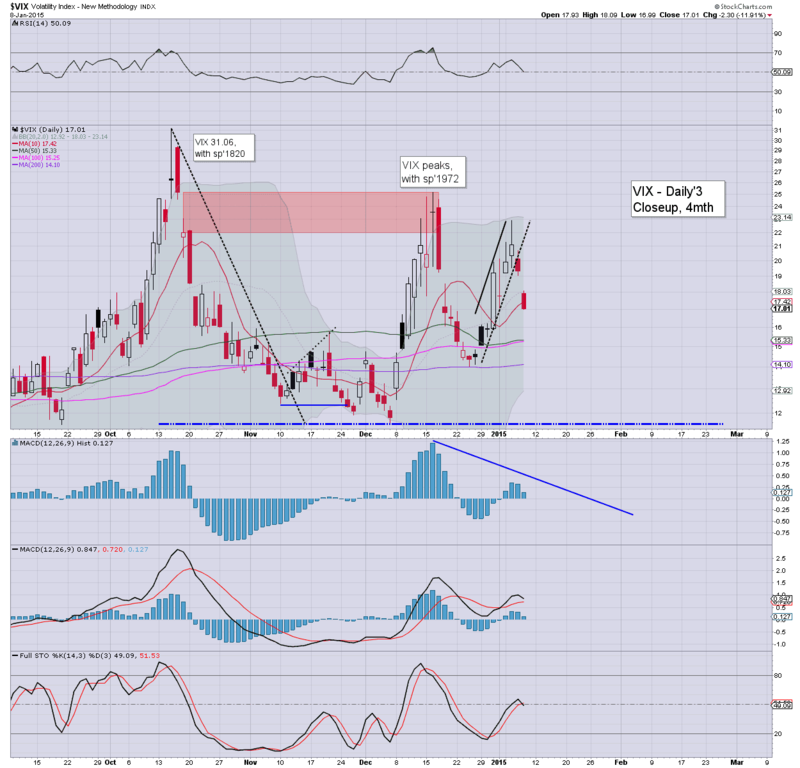 With equities climbing strongly for the second day, the VIX was naturally continuing to cool, settling -11.9% @ 17.01. Near term outlook offers the 15/14s, but if sp'2100s.. then the 12/11s remain a very valid target by late Jan/early Feb.
VIX looks set to melt lower into the weekend. 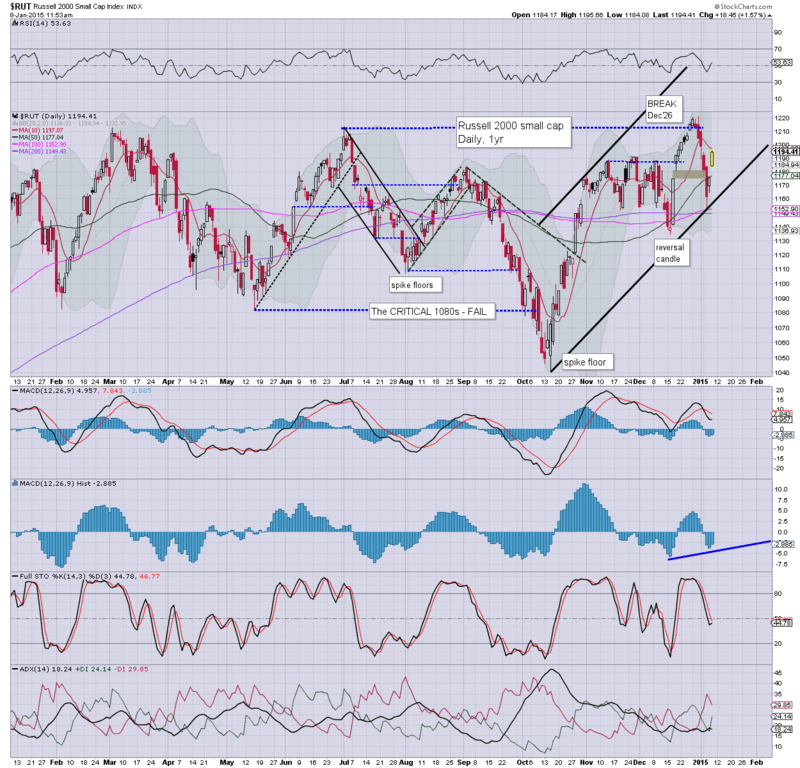 US equities saw a second day of increasingly strong gains, sp +36pts @ 2062. The two leaders - Trans/R2K, settled higher by 2.1% and 1.7% respectively. 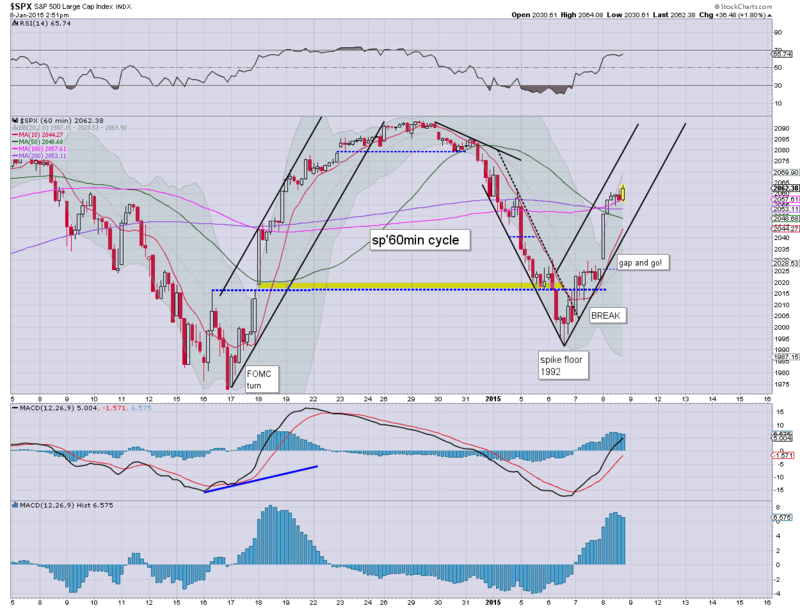 Near term outlook is bullish into the sp'2100s. Today was day'2 UP... there are very likely at least another 3 or 4 days to go. As some realise.. there is little reason why this up wave won't broadly continue into next Fri' opex... and by then.. .we'll probably be in the 2100s. Whether we get stuck around 2110, 20s, or even somewhat higher.. for now... I just don't much care. On what is merely day'2 of a new up cycle.... there is little to add. I realise a fair few are seeking a pull back after the next jobs data... but daily MACD cycles (set for a bullish cross).. argue against it. Broader upside remains the case. 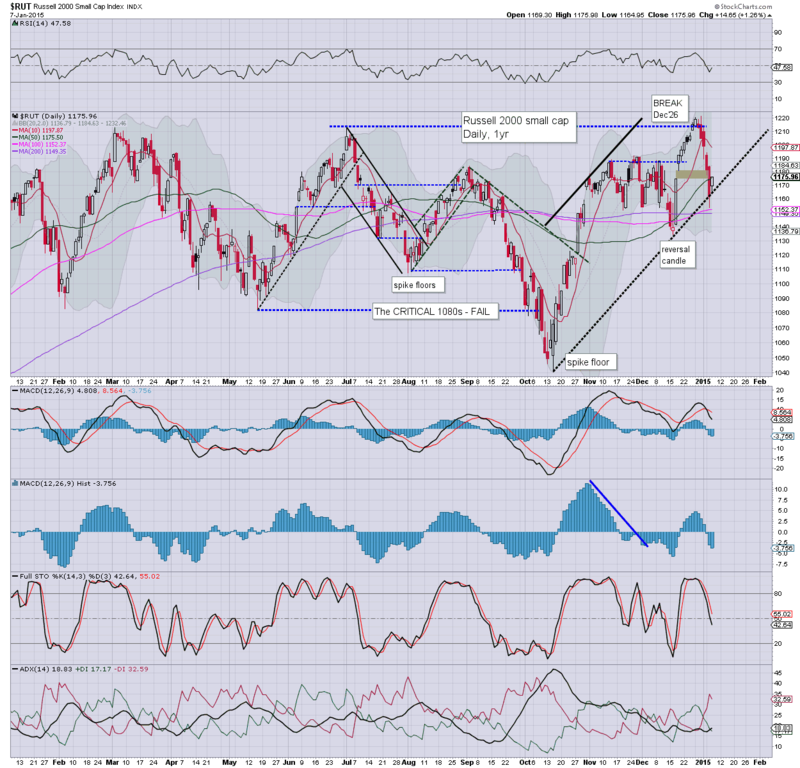 US equities are holding rather powerful gains, with the sp' set for a close in the 2060s. VIX is in classic melt mode, -9% in the 17.40s... the sub teens are due.. if a straight up move to sp'2100. Metals are sliding, Gold -$4. Oil has failed to hold opening gains of around 1%... now -0.7%. 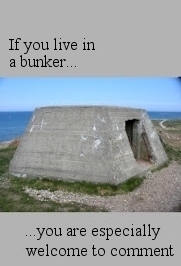 I reading around a little... I think far too many are again getting overly focused on the minor noise. The jobs data is surely going to come in 'fine' tomorrow (not that I'm one for US Govt' stats)... market should merely continue higher... whether from the open.. or by the close.. it makes ZERO difference. *I still think many are not taking the recent break higher to new highs in the R2K seriously... but then.. few took the Transports seriously in late 2012. 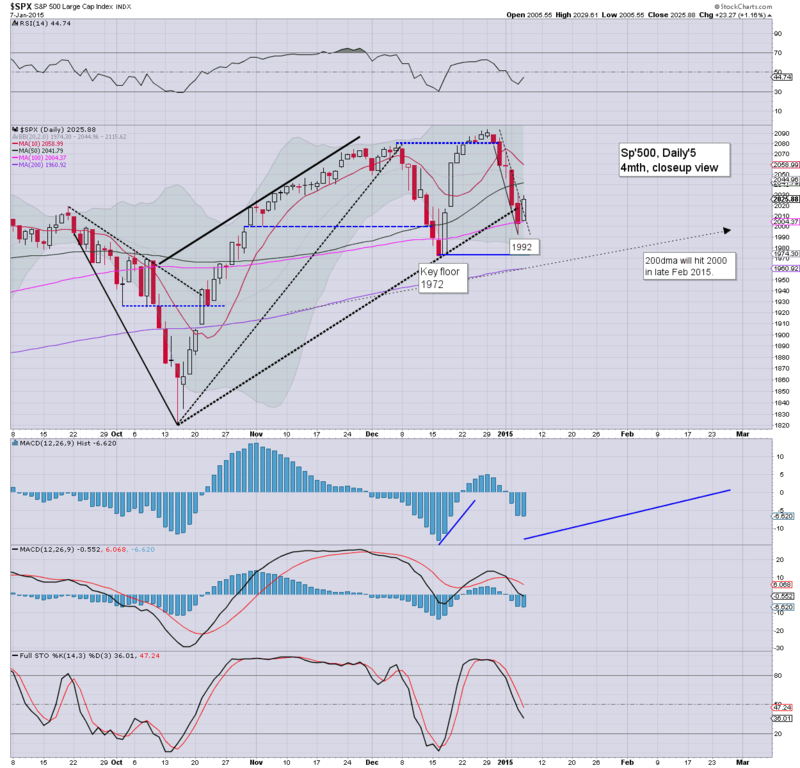 Today is clearly day'2 of a new up wave... one that seems headed for the sp'2100s. No doubt a lot of top/crash callers will be appearing in late Jan/early Feb... but then... what else is new? Metals and Oil are both trading flat, despite the relentlessly climbing USD, +0.3% in the 92.20s. 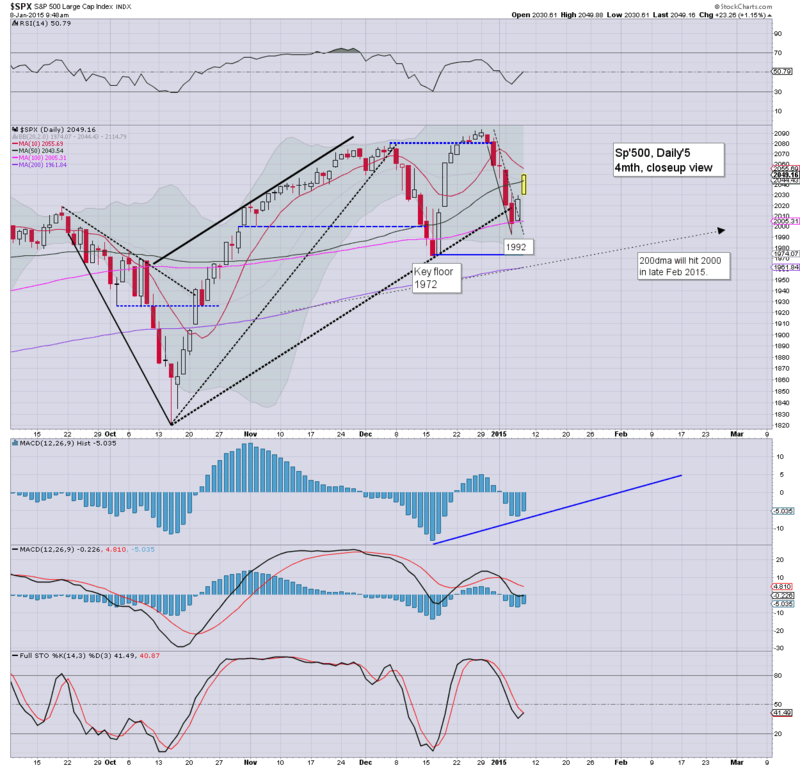 I thought it was a bold outlook to see the sp'2050s by late Friday... and yet.. here we are.. sp'2060s. Without question... things are back to 'normal service'. Market looks set to continue higher tomorrow on 'good jobs data'. To my surprise, it looks like we'll see net weekly gains... with a very clear spike floor of sp'1992... already some 3.4% lower! *I remain long the R2K... am in no hurry to exit. 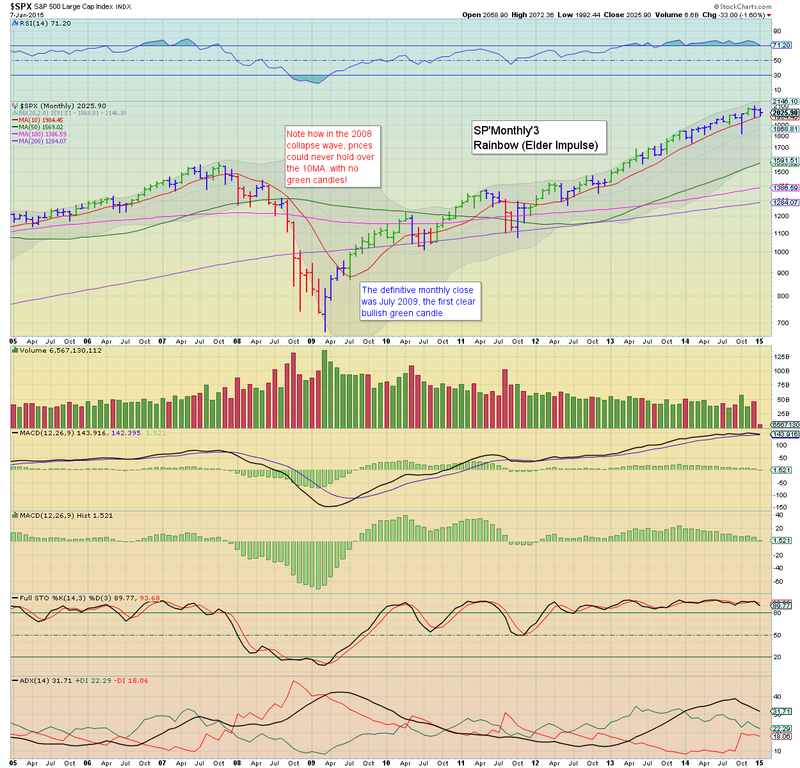 The turn from sp'1992 appears fully confirmed, with a decisive re-take of the 50dma on most indexes. The weekly cycles are already close to turning net positive on the week. Commodities are mixed, Gold -$1.. whilst Oil is a touch higher, +0.2%. *weekly 'rainbow' candle flips from red.... to blue. If market likes the jobs data tomorrow, we now look set for a net weekly gain, which is frankly... incredible... but then.. the rallies (at least recently) have been more powerful.. and faster than the down cycles. back in an hour... probably. 11.21am.... I return to.... sp'2060... pretty nuts.. way beyond what I was looking for. Good morning. Futures are higher, sp +16pts, we're set to open at 2041... back above the 50dma. Metals are a touch weak, Gold -$3. Oil continues to bounce, +0.9%. *weekly jobless: 294k... broadly in line. It looks like we're getting early confirmation that yesterday was indeed day'1 up of a new cycle. For 'absolute' clarity, I'd like to see a daily close in the 2050s... and that now actually seems just about possible today. Market looks set for a second day of gains.... a close above the 50dma for most indexes will be a particularly bullish sign ahead of tomorrows big jobs data. For the bears still short... this is no doubt annoying, but hell, they should have bailed a day or two ago. Hourly cycle offered a rather clear spike floor on Tuesday afternoon, even I noticed it! US equities saw the first net daily gain of the year. 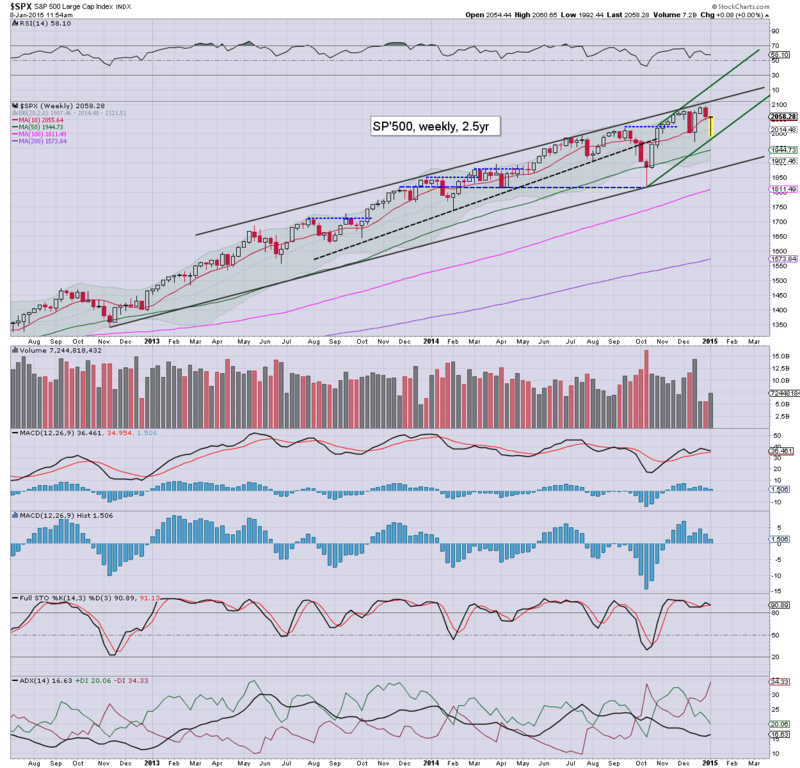 With 2 days left of the week, a net weekly gain looks unlikely, but any Friday close in the 2040s.. or even 50s will be more than enough to confirm that the sp'2100s are due before month end. *it is notable that the monthly 'rainbow' chart has been without a single red candle since Sept'2011... truly.... utterly... incredible. Upper bollinger is offering the 2140s... whilst weekly cycle offering 2110s.... so... that is a clear 4% of upside in the near term. It would seem that the spike-floor candle (see hourly charts on earlier post) are indeed indicative of another floor. The bull manaics just need a daily close in the 2050s to fully clarify that new historic highs are coming. Whether that occurs by this Friday.. or early next week, really shouldn't matter to anyone already on the long side. Thursday will see the weekly jobless claims and consumer credit. 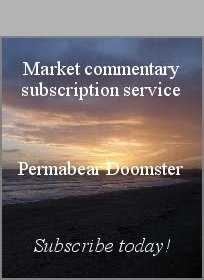 No doubt though, Mr Market will be more focused on the monthly jobs data.. due Friday. Market is seeking net gains of 245k.. with a slightly lower headline jobless rate of 5.7%. Those estimates do not seem overly hopeful. US equities managed to hold rather significant net daily gains, sp +23pts @ 2025. The two leaders - Trans/R2K, settled higher by 0.7% and 1.3% respectively. 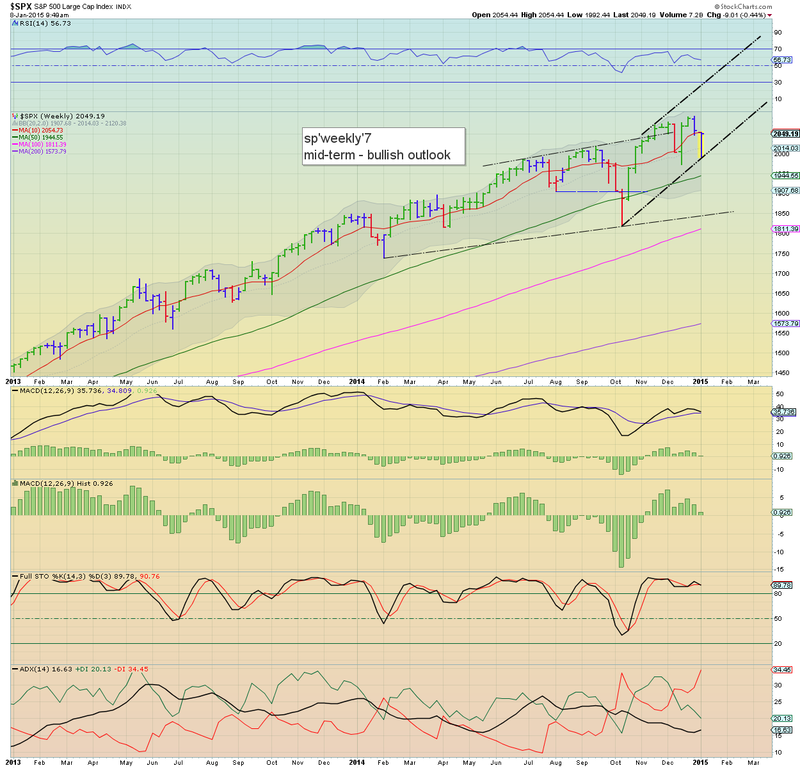 Near term outlook offers 2045/55 by the weekend, with new historic highs before month end. Clearly, the daily MACD (blue bar histogram) cycle have another few days before we start seeing some bullish crosses. R2K was a little laggy for most of the day, but caught up into the close. The 1220s are a fair ways higher, but 1250/75 zone looks a valid target in the next wave... into February.